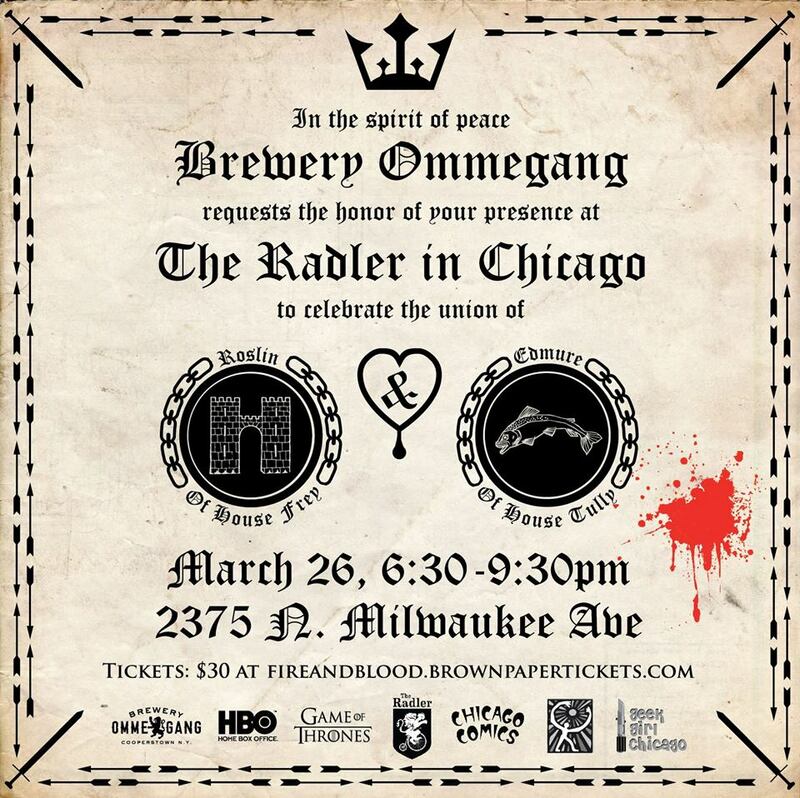 Win Tickets to the SOLD OUT Brewery Ommegang Game of Thrones Beer Party! Most importantly, I've been planning a wedding. No, I don't mean my own wedding. I'm helping Brewery Ommegang and Lakeshore Beverage put together a night to remember celebrating Game of Thrones. I will be hosting an epic costume contest with prizes from Chicago Comics. My beloved geek guy is choreographing some of the night's more... intense moments. There will be food, music, and of course, beer. I'm trying to finish my Daenerys costume, and can't wait to take pics with all of you in the photo booth. It's Fire and Blood Ale, after all- they'd better have a Khaleesi! The party is SOLD OUT, but there's still an opportunity to score tickets in the next 48 hours. CLICK HERE to enter Lakeshore Beverage's official giveaway. Two lucky winners will each win a pair of admissions, announced on the 24th. Go, go, go!! Brewery Ommegang's Fire and Blood Red Ale Launch Party. Wednesday, March 26th, 6:30 PM. The Radler, 2375 N. Milwaukee. SOLD OUT. Win tickets HERE. Get the lowdown on all of Chicago's geekiest parties; become a Geek Girl Chicago fan! Follow me on Facebook, Twitter, or via e-mail subscription. Don't miss a post. Type your email address in the box and click the "create subscription" button. My list is completely spam free, and you can opt out at any time.